Progress for the host nation, as the second day of qualification, Thursday 14th June, came to a close in the Women’s Singles event at the 2018 ITTF Challenge, DPR Korea (Pyongyang) Open, there was notable success. Pyon Song Gyong, Jong Un Ju and Cho Hyon Hwa all completed their initial itineraries unbeaten and thus in first places in their respective groups. Impressively Pyon Song Gyong beat Iran’s Neda Shahsavari (11-7, 11-7, 11-7, 11-6) and Vietnam’s Vu Thi Thu Ha (11-3, 11-5, 11-1, 11-1|) to secure first place in her group. It was no different from Jong Un Ju who accounted for Dinh Thi Hue, also from Vietnam (11-3, 11-1, 11-6, 11-6), nor for Cho Hyon Hwa. She beat Mongolia’s Bolor-Erdene Batmunkh (11-8, 11-4, 11-2, 11-3) and Iran’s Parinaz Hajilou (11-4, 11-5, 10-12, 11-2, 11-8). Success for host nation players but the young ladies to attract the attention were visitors from China, Guo Yuhan and Li Jiayuan; not only did the conclude the final day of qualification unbeaten in their Women’s Singles groups, they did exactly the same in the Under 21 Women’s Singles competition. Guo Yuhan caused DPR Korea problems. In the Women’s Singles event, she beat Kim Sol Song (5-11, 11-8, 11-13, 11-5, 11-4, 11-1) and Kim Su Hyang (11-6, 11-9, 11-6, 11-4); in the Under 21 Women’s Singles competition she accounted for Vietnam’s Dinh Thi Hue (11-5, 11-5, 11-4). Similarly, Li Jiayuan overcame the host country’s Kim Jinju (11-8, 11-7, 11-3, 11-3) and Vietnam’s Dinh Thi Hang (11-6, 11-5, 11-7, 11-2) to secure first place in her Women’s Singles group. In the Under 21 Women’s Singles competition, first position was reserved courtesy of success in opposition to the home nation’s Kim Un Sung (11-2, 11-7, 11-8). 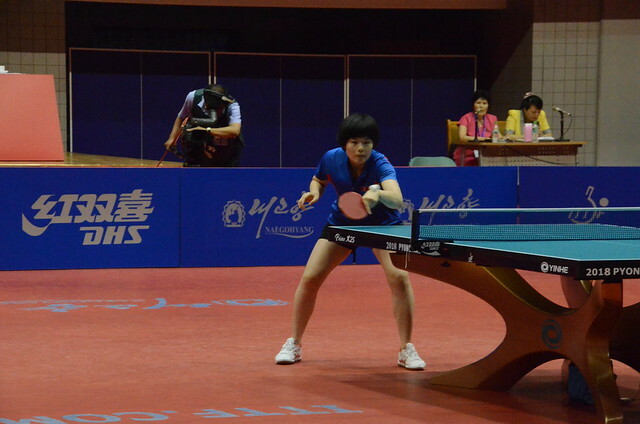 Defeat for DPR Korea as the Under 21 Women’s Singles qualification tournament came to a close but there were successes and therefore first places finishes. Kim Kum Yong beat China’s Li Yake (11-6, 11-9, 11-8), Ri Il Gyong defeated colleague Ri Hyang (11-9, 11-7, 9-11, 10-12, 11-6). Play in the main events commences on Friday 15th June.